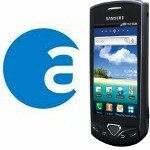 Alltel and Samsung announced the availability of the Samsung Gem in the carrier's portfolio. The Gem is running android 2.1, and has a 3.2" screen with 240x400 pixels of resolution and anti-smudge coating. An 800MHz chipset runs the show, and the Samsung Gem is graced with a 3.2MP shooter on the back. Swype comes preinstalled for all your alternative text input needs. As per the press release: "Alltel Wireless continues to be an industry leader, providing customers most recently with “Best Value Unlimited Plans” which offer the most affordable and flexible options for those who love to talk and remain connected. Alltel Wireless also provides customers its exclusive “My Circle” feature – unlimited calling to and from any 5, 15 or 25 numbers on any network and unlimited text to their circle on select plans – as well as the innovative “Free Fridays” feature, where all calls on Friday are free on select plans." The Samsung Gem will retail for free, after a $50 mail-in rebate, when you sign a two-year contract with Alltel. Times they are changing, just a year ago it would be unthinkable you could get this Gem for free, and now much better Android handsets are going for no cash at all too.